The Cherokee Nation’s Kawi Café is now serving up its signature Cherokee blend coffee in downtown Tahlequah, while giving budding entrepreneurs firsthand experience running their own business. 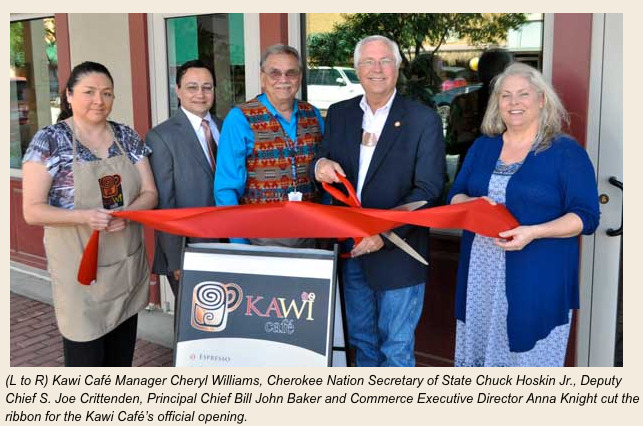 A ribbon-cutting was held Thursday at the café, which the Cherokee Nation opened last month in a 1,096-square-foot section of the renovated former Cort Mall. While the café offers customers coffee, cappuccino, latte, soup and panini in a quaint coffee house setting, customers won’t necessarily notice what the café offers its employees. Those who work at Kawi Café are Cherokee citizens wanting to start their own business or run a business one day. About nine trainees at any one time work four-month stints in the café learning how to run a business, while spending one day a week working on their own personal business plan. Many participants hope to apply for a Cherokee Nation small business loan after the program ends. Michael Fuller, 24, of Tahlequah, is starting a business to sell kits for A-frame hydroponic greenhouses so homeowners can grow their own organic vegetable gardens. Working at the Kawi Café, he’s made decisions on what food and beverages to include on the menu, pricing and ordering of supplies and materials. The Cherokee Nation Commerce Department estimates the café’s yearly revenue to be $91,000 in the first year and as high as $114,000 by the third year. Some of the startup funding came from an Administration for Native Americans grant. Cherokee Nation Commerce helps build the economic security of Cherokee citizens and communities. In the past 18 months, Cherokee Nation Commerce has provided $2.7 million in small-business loans to more than 40 Cherokee-owned businesses. Those loans have helped create or retain 223 jobs in the tribe’s 14-county jurisdiction. Commerce also holds several training classes and workshops throughout the year. For more information on Cherokee Nation Commerce programs, call 918-453-5536. For more information on the Kawi Café, open Monday through Friday, 7:30 a.m. to 3 p.m., and Saturday, 9 a.m. to 2 p.m., call 918-458-6114.